Madagascar Underground i Antananarivo, Madagascar: Reservér nu! Madagascar Underground is Madagascar's very first and only hostel located in the heart of Antananarivo. Super cool and comfortable accommodation at an unbeatable price. We can hook you up, advise, and get you to all the best spots around Mada, the fastest and most stylish ways possible. 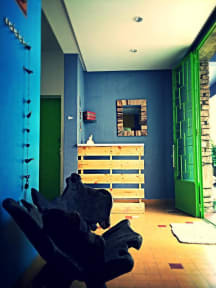 The hostel is situated in a large, open spaced, late 60\'s post art deco retro house. With multiple terraces, large bar/lounge, cinema and games room, restaurant and backyard. The hostel is located in a quiet street in the city centre. Super safe, and no traffic. Easy walking distance to all the other bars, restaurants and clubs. The easiest way to find us is to ask for the old american embassy in Antsahavola. We are right next door. Our two dorm and one private room have secure lockers, 4 shared toilets and 4 shared showers. One private has an ensuite with toilet and shower. All rooms share a communal kitchen, and can use the cinema/games room and library. Secure luggage storage, and day use is also available. Had an excellent stay at Madagascar Underground, especially the staff were very helpful. By far the best hostel in Tanna.